Like no green tomato you’ve ever seen or tasted. 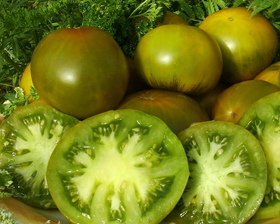 This spectacular introduction, a deep shade of emerald green, is one of the greatest tomatoes. The meaty 200-300g tomatoes are wondrously sweet and juicy. Edible perfection: raw, baked, grilled or sauteed. Make a distinctly different salsa and pair it with its red and green counterparts. Height 1,2-1,5m. Sow seeds February-May 6mm deep in pots or trays of good, free-draining, damp, seed compost and cover with a sprinkling of vermiculite or compost. Place containers in a propagator, or seal in a polythene bag, at a temperature of 18-21C until germination, which takes 7-10 days.